Welcome to my website about the movie DUEL. It is my tribute to the cast and crew of this excellent film. David Mann is minding his own business driving down a desolate California highway when a maniac in an old Peterbilt starts to harass him. There's no way to escape the truck because as Dave puts it,"He's got some souped up diesel". Not to mention he knows every curve in the road and is very determined. The truck even has a front bumper made out of small railroad rails! The Plymouth Valiant just can't seem to outrun the Peterbilt. Even when Dave stops at Chuck's Cafe for lunch, the truck waits for him to get back on the highway. 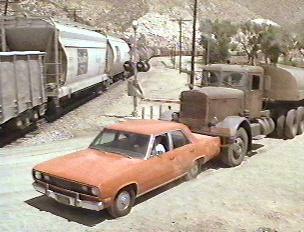 In one of the best parts of the movie, the truck nudges Dave and his car towards a passing freight train at a crossing. This gets very stressful for Dave and he barely escapes. Farther down the highway, Dave stops at Sally's Snakerama Station to call the police, but they're useless and the Peterbilt gets agressive again and kills the phone booth. After a very exciting chase, the Peterbilt finally nails the Valiant and pushes it off a cliff. Fortunately, Dave is not in his car at the time. In the end, Dave survives his ordeal and seems to be very happy that it's over. The IMDB describes DUEL as an action thriller, but after you watch it a few times, you realize it's loaded with hilarious scenes. 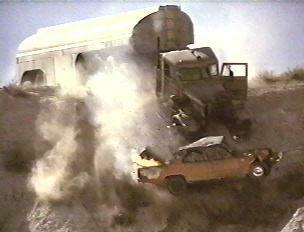 For some reason it's funny to watch David Mann try to escape being murdered with a truck. The movie is pretty realistic and Dennis Weaver acts excellent in every scene. The truck driver, Carey Loftin also did a fantastic job maneuvering the truck at high speeds on the narrow roads near Acton, California. It's too bad movies aren't still made like this one. It can be rented at many video stores and can be bought at Wal-Mart. Be sure to click on the IMDB link below for more info on DUEL and almost every other movie or TV show ever made. 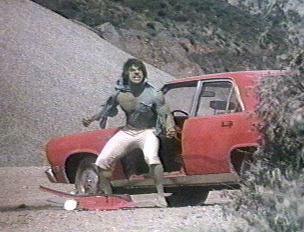 Amazingly, parts of DUEL were used in The Incredible Hulk TV series. 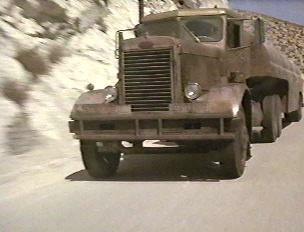 In The Hulk episode called "Never Give a Trucker An Even Break" Bill Bixby and co-star Jennifer Darling drive around in a Peterbilt that is a copy of the one in DUEL. Then they switch to a red Valiant and are chased by two guys in the truck. 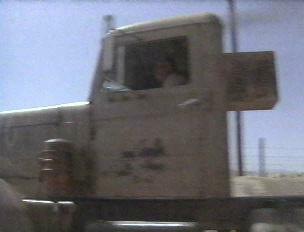 Many scenes show the truck in more detail and close-ups than in DUEL. The whole episode centers around the old Peterbilt. In the end, the Hulk bashes the truck with a phone pole and then pushes the Valiant into it. Many original scenes are used from DUEL. For more info and pictures from this Hulk episode click here. How can he go so fast? about DUEL that can't be found anywhere else, please email me. I answer all email. If no reply within 24 hours, please try again, as Hotmail has been losing some email lately. If you like this DUEL website, I'd like to hear from you! The movie DUEL is owned by Universal City Studios. The Incredible Hulk is a trademark owned by Marvel Comics. The Incredible Hulk TV series is owned by Universal City Studios. The Dukes of Hazzard TV series is owned by Warner Bros.This website was created for entertainment and educational purposes only.